With the introduction of modern technologies, there have been improvement in laser leveling equipments and new types of leveling equipments have been evolved with wide 360-degree view of vertical and horizontal axis. They are rotary laser level machines. Nowadays, rotary laser level is widely using for construction purpose in order to get the proper leveling result. In this rotary laser level review, features, advantages and using procedure of Bosch’s GRL300HVCK are discussed in details. 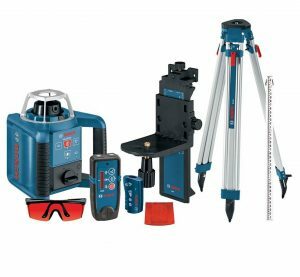 In market, one can get a variety of rotary leveling machines from different manufacturers, but, depending upon the reliability, ease of usage and considering the price, the rotary laser level from Bosch is one of the ones. 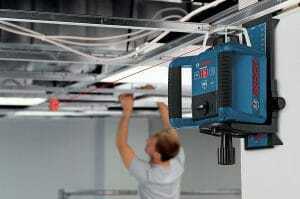 Bosch’s GRL300HVCK is the most popular and best rotary laser level available in the market. This product comes with great features like no other laser levels in the market and you can work smartly using the same. It is equipped with speed selection mode and adjustable scan angles for maximum visibility on low light conditions. Moreover, it comes with layout beams, which help in quickly aligning the sensory in the laser with the line. It is equipped with electric self-leveling capability for both horizontal and vertical axis. Due to this facility, this product is able to provide total 360-degree view of the plane. There is no need to manually controlling it for aligning the sensors with beam for making a line out of a dot. Another excellent feature of the product is its battery backup. With two 2D batteries, it is capable of giving at least fifty hours of battery backup. It makes the job easy for the engineers to work fluently without any disturbance. It is remote controllable and there is no need to manually control it. The advantage of remote controlling is that, it saves the time and hard work for aligning the laser beam for a better plane leveling. Moreover, due to its remote controlling feature, only one person is enough for doing any plane leveling job. This rotary laser level also comes with protected cage for assembling the head of the laser leveler. It enables in quickly accessing the laser beam from a known point. Moreover, its powerful built body makes it attractive and reliable. Thereby, recommending it as one of the best rotary laser level available in the market. You can also check some of the rotary laser level review on the web to know what other users are saying about this product. One has bought a laser level and has not thought about its laser range is totally foolishness. Workings of a laser level depends on its range, the more its range is, the better it is efficient for work. This product has come with a solution with a range of almost 1000-ft when equipped with a detector. Without a detector, it ranges up to 300-ft.
Its accuracy level is also great up to ±1/8-in at 100-ft. Its laser diode is 630 – 670 nm Class 3R. Self-leveling range is ±5 degree, which is higher than other similar products. Its mount threading ability is 5/8 – 11 which is also very good for construction works. This rotary laser level can be used in 14° F / -10° C up to 122° F / 50° C. Moreover, it is very light weighted, only 29.6 pounds. This feature makes it very easy to carry here and there. It also comes with 2 years of manufacturer warranty, which makes it the best laser level available in the market. 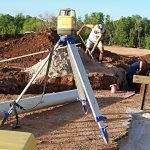 Its left leveling technique has great advantages for construction work and survey work as well as for home based work also. If you want to remodel a room, this rotary laser level machine from Bosch can help in easily doing so by automatically projecting a straight line on the wall. With its 360-degree horizontal and vertical axis view and remote controlling feature, it is able to perform the job easily; it can do a leveling work 4 times faster than other laser levels. Due to its low weight comparing to other laser levels it is easy to carry. The large gripping handles make the work of carrying the object easy. Equipped with all these new features, it is able to save time and hard work of a user. Other advantages of using this Bosch GRL300HVCK rotary laser level is easy checking of door height, easy marking of construction areas like floors, walls, etc. Another advantage of using this laser level of Bosch is that it helps in easily projecting of an entire area through its remote controlling and 360-degree view feature. Its high technology is able to warn whether any units have gone beyond the projection area or beyond the level. Its accuracy level is better than other laser level found in this product category. This accuracy makes sure high quality of leveling. Thereby, this extra advantage makes it one of the best rotary laser levels. The product has so many advantages. In order to use it, one needs to understand the using procedure of this rotary laser level. The usage procedure is very easy, just few steps. Just place it in a plane, recommended a tripod, which can easily hold it. Now, Chose level and turn on. As it is self-leveling, allow some time to level. If requires, manually configure it with the help of the user manual. When the receiver beeps, that means it finds a connection with the laser. Now, aim the laser level to the surface needs leveling. That’s it. 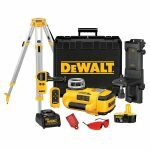 This easy installation of this laser level makes it the best laser level. With its new technology and ease of access, it has become one of the best rotary laser levels. Moreover, comparing to other laser levels in this category, it can be obtained in a very low price. One can get it by paying only $750 to $900 from different e-commerce sites or from the direct outlet. If you want to use this product for construction projection and survey work purpose, then there is nothing better than the all-new Bosch GRL300HVCK rotary laser level.